In addition to Harmer Street the Conservation Area includes Berkley Crescent, 39 and 42 to 46 The Terrace, and 26 (formely The British Tar P.H. ), 144/145 (formerly The Post Office) and 146 Milton Road. Harmer Street and Berkley Crescent together form the initial stage of an ambitious but uncompleted speculative "new town" plan attributed to the Brighton Architect Amon Henry Wilds (also the designer of Gravesend Town Hall in High Street) and constructed in the late 1830s. It was to have formed a north-south axis running from The Royal Terrace Pier, through The Grove (formerly Upper Harmer Street) towards Windmill Hill. The main part of Harmer Street consists of two continuous brick-built terraces comprising pairs of buildings which step up to accommodate the slope of the land - a feature emphasised by heavy string-courses and cornice bands. Window surrounds are quite plain, and the wrought ironwork of the first floor balconies significantly enhances the collective character and elegance of the terraces. A number of these balconies were lost because of structural failure but many have now been successfully restored. The two corner buildings in The Terrace form important "gateway" features to Harmer Street, which widens out at its southern end - a conscious attempt to frame the view of Windmill Hill beyond and capitalised on fifty years later by the construction of the Jubilee Clock Tower, which also adds emphasis to the formal layout of Harmer Street and Berkley Crescent. By the 1990s, all that remained of the elegant colonnades, which framed Berkley Crescent, was a small portion in front of Nos. 4 and 5. The entire colonnades, including the balcony railings above, have now been restored to their former grandeur. 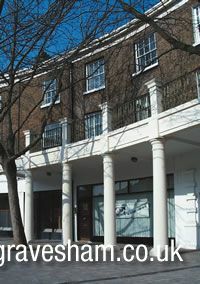 Trees planted in front of the colonnades help to "soften" the buildings behind them and add character and interest to this attractive area of the town. The street-lamps which marked the four corners of the former square island containing the clock tower have also been reinstated. Some of the original timber-framed buildings such as the Terrace Tavern still survive and "The British Tar" P.H. (built 1805) (now TJ's), also timber-framed, exhibits Gravesend's only surviving example of mathematical tiling. The two buildings at the corner of The Grove and Milton Road are also important features of the Conservation Area, turning the corner and framing the view southwards to Windmill Hill. The importance of the buildings in this Conservation Area has been recognised by the inclusion of most of them in the statutory list of Buildings of Special Architectural or Historic Interest. The remainder are "local interest" buildings.